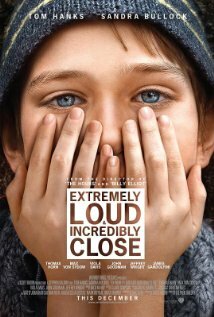 This review of "Extremely Loud and Incredibly Close" was written by guest blogger Liz Parker. Extremely Loud and Incredibly Close was released in limited markets on Christmas Day 2011, to qualify for Oscar season, but is just now being released nationwide. It's based on the acclaimed novel by Jonathan Saffran Foer, whose novel Everything is Illuminated was also made into a movie. EL&IC is one of the more realistic 9/11 movies I have seen, and the fact that it is told from a child's point of view, for the most part, makes it all the more powerful. Oskar Schell (newcomer Thomas Horn) lives in New York City with his mom (Sandra Bullock, The Blind Side), and his father (Tom Hanks, Larry Crowne), a man of science who owns his own jewelry store. Oskar is definitely precocious, and was tested for Asperger's Syndrome but "the results were inconclusive," he explains early in the film. Indeed, it appears he does have Asperger's, as he has a hard time talking to people, he carries around a tambourine that helps him through his fears, and he obsesses over anything and everything. His father assigns Oskar clever assignments, masquerading as "challenges," that involve him having to interact more with people and the world around him, and this seems to be helping his condition. Oskar's world is turned upside down on 9/11, however, as his father is in the Twin Towers for a meeting, and cannot escape. Oskar's world already revolved more around his father than his mother, and is changed irrevocably. After finding a key of his father's that he thinks was meant for himself, Oskar embarks on a "challenge" to find the lock in which it fits, convinced that it is a message of sorts from his father. The acting in this movie was phenomenal, and Thomas Horn, who wasn't even an actor until about 18 months previous, should be noted for his breakout performance. Horn won Jeopardy! Kids Week in 2010, earning $31,000, and it was then that EL&IC producer Scott Rudin gave him a call to see if he wanted to audition for the part of Oskar, as they were looking for a bright young individual. If I hadn't know this before seeing the film, I never would have guessed Horn was a first-time actor, as he held his own right alongside Sandra Bullock and Tom Hanks. Hanks's character, of course, is mostly seen through flashbacks, but it's obvious that he has a huge impact on Oskar, and Bullock also does a great job as his mother. Viola Davis (The Help) has a small part as someone Oskar meets on his journey, and Max von Sydow (Robin Hood), too, as a renter in Oskar's grandmother's apartment. Jeffrey Wright (The Ides of March) and John Goodman (Red State) have bit parts too. Yes, see this movie, but be prepared to bring some Kleenex to the theater. I don't usually cry during movies, but I will admit that I was definitely tearing up at a few of the scenes. The movie paints a picture of 9/11 without overwhelming us with images of burning towers and chaos - it sorts of paints around the lines rather than directly in it - yet it still manages to evoke strong emotions both in its characters and audience watching the film. EL&IC captures the aftermath of 9/11, specifically in Oskar's world, and shows how he desperately needs to cherish and stay connected to his father's memory, despite the challenges that may keep him from doing so. Extremely Loud and Incredibly Close is in theaters today, January 20th, and is rated PG-13 with a runtime of approximately 120 minutes. 4 stars out of 5. *Author's note: The screening I saw of this was on 12/8/11. It may or may not have been the final version of the film.